Bertha, Jesse and I in the Bayou in Louisiana. Check that stink eye out! Apparently I didn't want my photo taken. Also, is it just me or do we look really young here?! I love my DSLR. Her name is Bertha and she helps me to take beautiful photos. She's been lugged here, there and everywhere - but you know what? Sometimes Big Ol' Bertha is just too heavy - so I leave her at home. Each time I leave Big Bertha at home, I tend to regret it - there's something I needed to take a photo of - or I miss something I wish I would have recorded. Even when I do take Bertha, she's a bit old so she can only take photos - not video - so I needed a new addition that could do it all. I've been thinking about buying a new DSLR for a long time - but when traveling I found I needed something more lightweight, compact - and something that fit perfectly in my purse. But how do you know what to buy?! You want something that's compact, easy to hold and carry and something that will fit easily in your purse, bag etc. The megapixels refers to the resolution of the images - what you have to remember is that a higher megapixel numbers doesn't necessarily mean that your pictures are going to be better. Many people think the opposite because that's what manufacturers lead us to believe - but the megapixels really refer to how big we can enlarge our image and how much we can crop and edit an image after it is taken. Most of us print 4x6s if we're going to print anything - and you can get a perfect print from a 5 megapixel camera at that size. I think your zoom is one of the most important features for a small compact camera. Often times, you're using these cameras for holiday snaps or candid images where you need to zoom up to take a picture of your subjects faces. There is a huge difference between optical and digital zoom. Digital zoom actually leads you to lose picture quality whilst optical zoom offers a true image when zoomed in as it pulls the image closer to you (thus the higher optical zoom, the better). When you zoom digitaly, the camera expands each pixel to make the image look bigger (thus you lose picture quality) - but the problem with digital zoom can be avoided if you buy a camera with a higher megapixel as this will mean you still have a decent looking picture. I always find, the smaller the camera, the more difficult it is to hold the camera still. This means it's really important that your camera has a built in image stabiliser which will help you to take a clear image, even in low light conditions or when zooming in. Many people don't realise that there are dozens of different memory cards and they don't think about them when purchasing their camera. Most cameras have a specific memory card they require (both type and size) and it's important that you know what you're buying. As I take hundreds of photos - I always buy the largest memory card possible so I don't have to carry around dozens of spares (because the last thing you want when on vacation is to have your camera telling you it's full when you need to capture something). Also look at the cost of the memory cards, to assure that you're really choosing an affordable option. If you can, play around with the camera in store (obviously this can't be done online - so do your research and check out reviews, watch youtube videos etc). You want to be comfortable with the camera and know how to use it - it also needs to do what you want it to do! Most cameras these days use rechargeable batteries which give you a little more shooting time than disposable batteries. Make sure you can easily buy a replacement/spare battery. I always like to have a spare so my camera isn't going flat when I really need to take a photo. This is where Bertha's little sister steps in. Meet Little Lou Blue - the Canon IXUS 135. This camera is super tiny compared to Big Bertha, fitting perfectly in my purse, Jesse's pocket and not so obtrusive in a social setting. Recently, Bertha came with us on our Stay at the Swissotel and was used to take photos during our dinner at JPB Restaurant and our brunch at DARE cafe - as it was way easier than trying to take a photo with Bertha and looking like your stereotypical food photographer. The IXUS was given to us by our friends at Snappit - an online photography community where you can buy cameras, share photos and post reviews. Snappit offers competitive pricing on genuine brands - all of which are new and in their original boxes (so you don't have to worry about shonky seconds) and have a minimum 12 month warranty. You even get a 14 day money back guarantee if you're not happy with what you've ordered (and you don't even have to pay the return shipping!). Currently they stock Canon, Nikon, Sony, Pentax, Samsung, Leica and JVC cameras - with everything from camera accessories (like cases and memory cards) to compact cameras and DSLRs. They even have some of my dream cameras. I love that it's super light weight, records incredible videos (I used it to take the Guinea Pig video) and takes quite a good picture. The creative filters are fun to play with - and the toy camera setting is very instagram-y. Whilst it's never going to take photos the way big Bertha does, Little Lou does a darn good job and I'd definitely recomment the Canon IXUS 135 for anyone looking for an affordable, compact camera. So tell me, do you name your possessions like me? 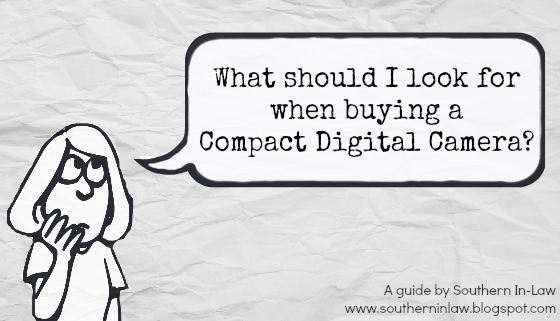 and what do you look for when buying a new camera? Kristy and Jesse received the Canon IXUS courtesy of Snappit so that they could test out the site and review the camera. No monetary compensation was received for this review and all opinions are their own.